Have you ever gone fruit picking? Every summer, when I was young, my parents would take us on a fruit picking road trip. We’d all pile in our maroon minivan, me in the middle seat and my brother in the back. We’d hit up all the Okanagan valley orchards, buckets and ladders at the ready. After a couple of days of sleeping under the stars (in a tent of course — after all, we are Asian! ), instant noodle breakfasts cooked over a campfire and literally pounds and pounds of fruit picked, we’d head on home where we would redistribute our fruity treasures. The call would go out and friends and family would trickle on over the next few days to gorge themselves on the orchard fresh fruit we just picked. The favourites, cherries, would go pretty fast and inevitably we would wind up with boxes and boxes of peaches that we would be stuck eating for breakfast, lunch and dinner. It’s a good thing I like peaches! Back then we would eat them as is, peach juice running down our hands and chins, the sweet taste of summer all wrapped up in a sun-ripened fuzzy jacket. Nowadays I like my peaches on things: toast, pancakes, even salad. Panzaella salad is the best because, well, there is no salad. Not a single leafy green in sight. Instead you have crispy, toasty cubes of bread doing an upstanding job substituting for your green leaves. Generally, panzaella is made with crunchy bread, ripe tomatoes, basil and a sharp vinaigrette. The bread soaks up the tomato juice and vinaigrette creating a fantastic combination of textures and flavours. 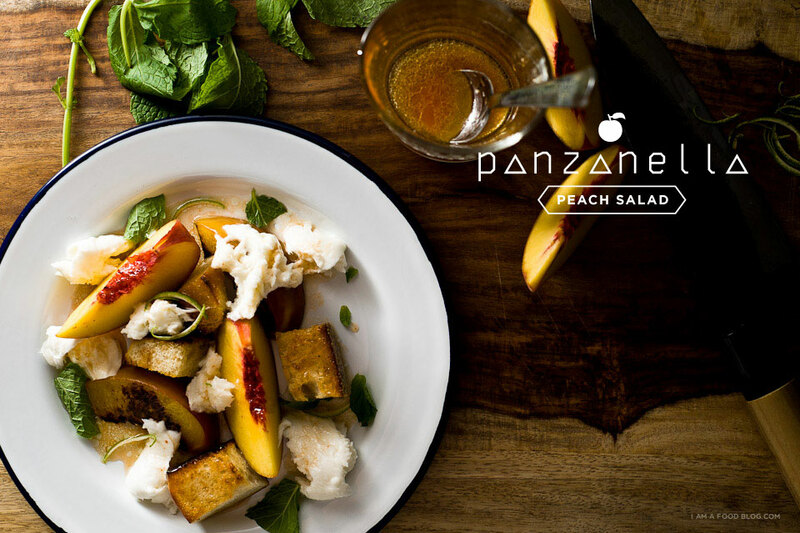 In my peachified panzanella, you have summer in a bowl: sweet, juicy peaches; a sour-spicy vinaigrette, creamy mozzarella and some fresh mint to tie it all together. I love the classics, but sometimes, something new is just what my tastebuds need. PS – This is what happens when you try to take an artistic shot of sriracha being squeezed into a cup…you end up with a pink stain on your countertop. 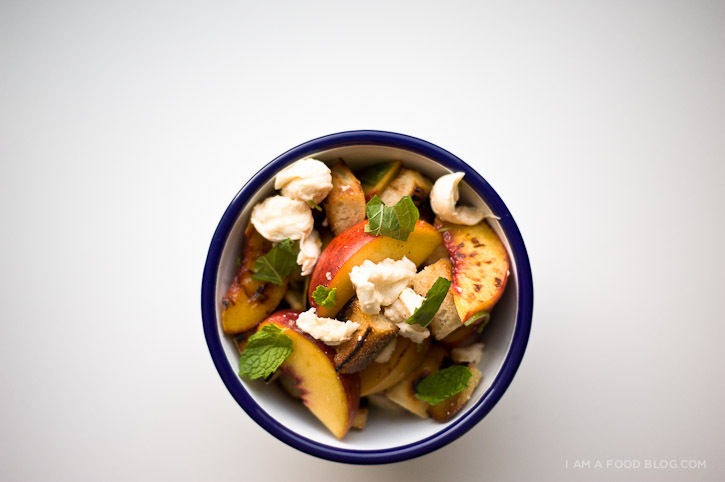 i am creamy, i am dreamy: i am peach panzanella with mozzarella and mint! 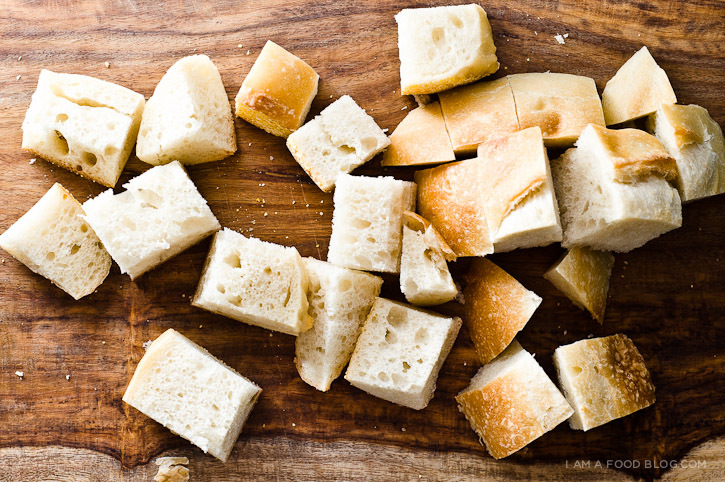 Toss the cubes of bread in 1 tablespoon of olive oil and toast all the sides lightly in a pan over medium heat. Alternatively, you can toast the bread in an 400°F oven for 10 minutes, tossing the cubes every so often. 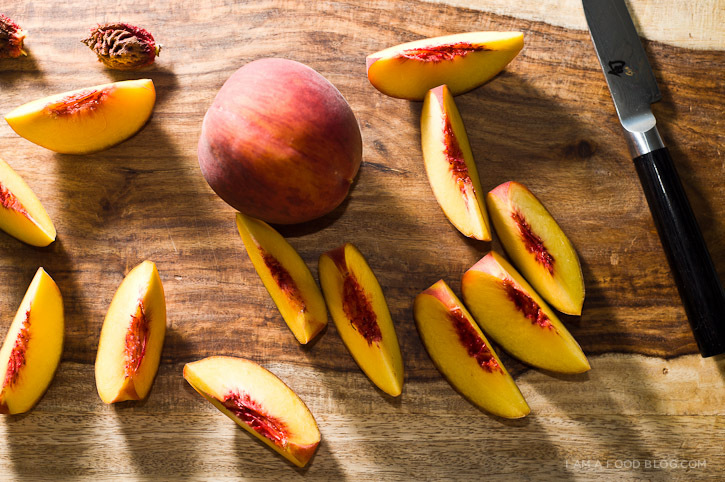 You can either have your peaches raw, roasted or both. I had both raw and roasted for some textural contrast. To roast your peaches, heat up a touch of butter in a small sauce pan over medium-high heat. Roast until golden and brown on both sides, about 2-3 minutes per side. 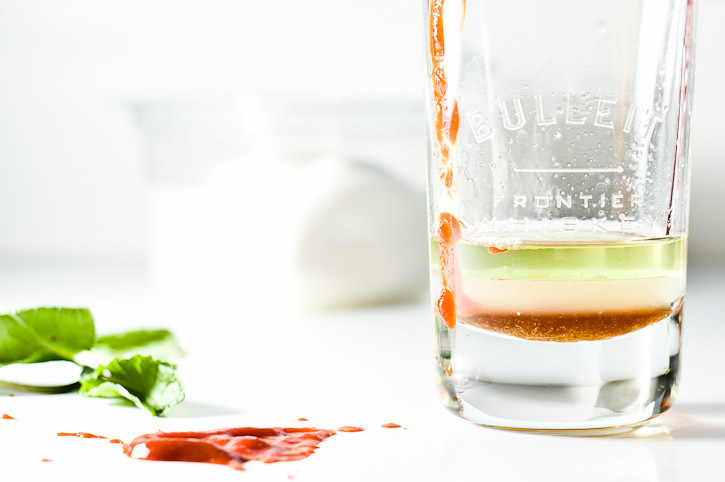 Whisk together the honey, lime juice, oil and sriracha. Taste and add salt and pepper as needed. 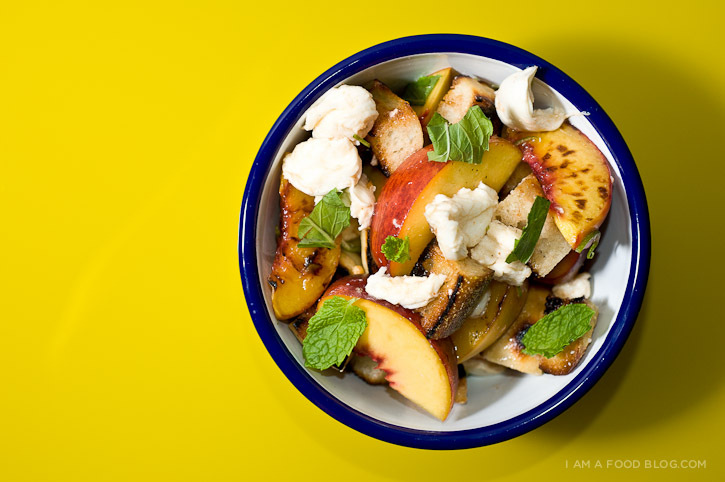 In a large bowl, toss together the toasty bread cubes, peaches, mozzarella and fresh mint leaves. Pour the dressing over the whole mess and give it a good toss. Traditional panzanella is left for a while so the bread soaks up all those delicious juices, but I like my toast cubes toasty so I tend to tuck in right way. This looks right up my alley. I’m trying to use more fruit in our non-uh.. dessert dishes, and peaches have such a nice texture and unique flavor for that. Now, if I can get my homemade mozzarella to turn out.. I’ll be all over this. Your photos are blowing mah mind. This looks delicious! Even the dodgy sriracha stain. I loved your blog and the pictures are just amazing . This is EXACTLY the recipe I was looking for! We have the most amazing peaches in Washington right now, I can’t wait to try them in this salad! The second I saw this my mouth crippled a lil’ bit!!!!! This looks and sounds amazing! Although some people think fruit and cheese is weird it is one of my favorite snacks. I really hope to try this soon, it’s is very convent because it’s so simple to make so it’s perfect for those snack cravings when you don’t want to waste so much time cooking!!!! !